7/7 Cup of Coffee: In what may have been his last start with the Sea Dogs, Henry Owens (pictured) tied a career high with 11 strikeouts over eight innings. Rubby De La Rosa was pulled after only one inning, which means he should be getting a start for the Red Sox this week, and Trey Ball had a second straight solid start, though his defense let him down. The PawSox late comeback fell short, as they fell to the Columbus Clippers (CLE), 5-4. Rubby De La Rosa got the start but went only one inning, as he may be starting in Boston on Wednesday. Chris Hernandez allowed five runs over the next four innings, and picked up his seventh loss of the season. Deven Marrero had another great game, going 3 for 4 with a double. Ryan Roberts also had three hits, and Mike Carp went 2 for 4 with a double and a walk. The PawSox brought the go-ahead run to the plate in the ninth, but Carlos Rivero lined out to end the game. 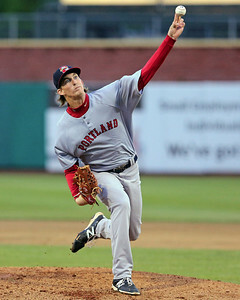 Henry Owens was spectacular again, as the Sea Dogs beat the New Britain Rock Cats (MIN), 6-1. Owens went eight innings, surrendering only one run on three hits, walking one and striking out 11, while throwing 68 of his 101 pitches for strikes. There is more on Owens at the end of the article. Noe Ramirez pitched a scoreless ninth to help the Sea Dogs move to 59-29 on the year. Derrik Gibson and Heiker Meneses each had two hits and a double, with Meneses driving in three runs. Sean Coyle drove in two more runs, bringing his total up to 17 in the last 10 games. Keury De La Cruz added two hits and an RBI, while Blake Swihart struggled, going 0 for 4 with three strikeouts. Salem's offense was in top form, as the Red Sox defeated the Carolina Mudcats (CLE), 8-2. Corey Littrell did not need much run support, but he got it anyway. He went the first seven innings allowing only one run on three hits, walking two and striking out four. The performance pushed his ERA down to 3.99 on the season. Matty Ott allowed only an unearned run in his two innings of work. The first six batters in the Salem lineup combined for 10 hits, with Aneury Tavarez going 2 for 4 with a home run and four RBI. Kevin Heller and Jantzen Witte each went 2 for 5 with a double, while Mike Miller added a double and scored a run. Some bad defense wasted a strong start from Trey Ball, as the Drive fell to the Augusta GreenJackets (SFG), 10-5. Greenville committed six errors, which allowed five unearned runs to score. Ball allowed only one earned run in five innings, walking two and striking out eight while inducing seven groundouts. Taylor Grover took the loss, allowing four earned runs over the final four innings. Tzu-Wei Lin went 2 for 5 with two doubles and Carlos Asuaje added a triple. Wendell Rijo went 2 for 3 with a double, and Carlos Coste went 1 for 2 with two walks. Lowell was roughed up, falling to the Tri-City Valley Cats (HOU), 10-5. Jake Drehoff gave up five runs in four innings, and the bullpen was not able to limit the damage. Edwar Garcia was the only pitcher to find success, tossing 1 2/3 scoreless innings. Cole Sturgeon led the offense, going 2 for 4 with his second triple of the year. Jordan Betts also added two hits, and Sam Travis collected a hit and an RBI. The Spinners did not draw a walk in the game. Player of the Day: Red Sox fans and his Eastern League foes alike hope that this dominant performance was the last Henry Owens will have as a member of the Sea Dogs. The left-hander is now 12-3 on the season, with a 2.21 ERA over 105 2/3 innings. He has been even better than that over his last 10 starts, pitching to a 1.28 ERA, while striking out 70 in 63 1/3 innings. Owens's next appearance will be in the All-Star Futures Game on July 13, and after that, it would not be surprising to see him in Pawtucket.